From the large group gatherings filled with cheers and dancing, to technical drills, to scrimmages, to healthy snacks, and to the much anticipated Parents vs. Coaches game, Soccer Nights is a very special time of year for both volunteers and families. The excitement is evident in both the kids and volunteers. 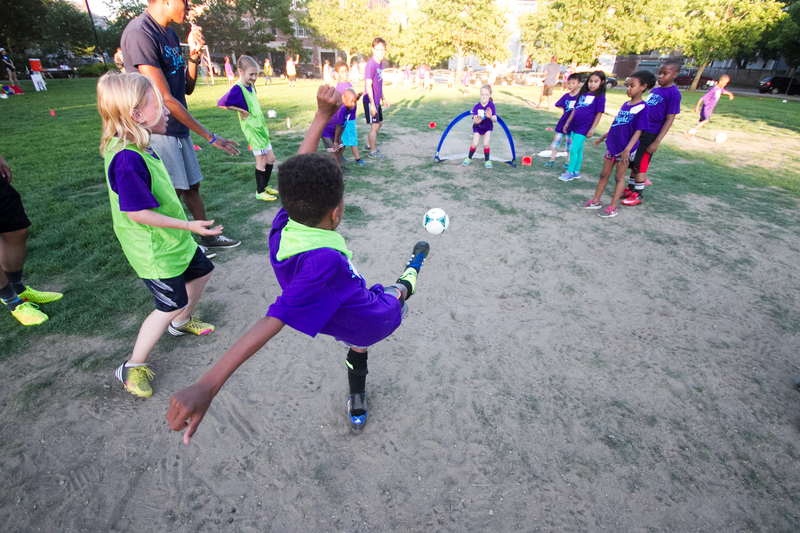 A long-time volunteer explains her enthusiasm: “The field is always a hodgepodge of different ethnicities, ages, cultures, and skill levels - it's really beautiful to see it all come together, for the love of soccer. I've volunteered as a coach every summer for the past seven years and would do it again next year in a heartbeat." So why soccer? The Soccer Nights program loves how soccer is a sport relatable across cultures, uniting and engaging people that might not ordinarily interact. Soccer is also a dynamic context in which to nurture a healthy lifestyle and important life skills on and off the field. This program is certainly popular among its communities. It’s organized by a collaboration of people and local churches; and overall, the program’s locations include Central Square, North Cambridge, Medford and Malden. It’s even spread to other states, including Maine, Colorado and North Carolina. When online pre-registration opened for the Central Square location, it filled (and started a long waiting list) on the first day! The Central Square, North Cambridge and Medford sites have completed the week-long camp with overwhelming success. The Malden site will run in the following weeks. For more information on Soccer Nights, please see their website: http://www.soccernights.org. For full disclosure, the author of this piece was involved in the organizing of Soccer Nights. Photos courtesy of Soccer Nights.